Since 1993, writing instruments have held the solid No. 2 place (right after wearables) as one of the top-selling promotional products and there’s a good reason why: Consumers love them. That sentiment was strongly evident in an independent study published in May 2012 by PPAI Research Manager Saritha Kuruvilla and Dr. Richard Alan Nelson of University of Nevada, Las Vegas. 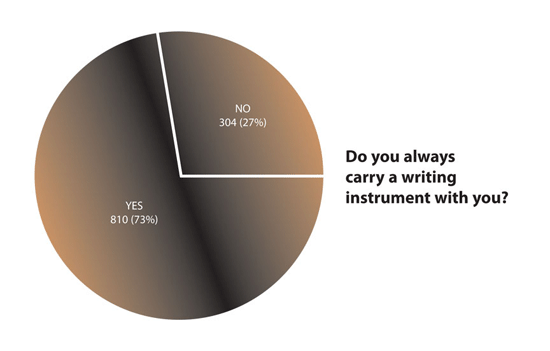 A panel of 1,114 consumers representing the general population of the U.S. was surveyed to find out their opinions and habits concerning writing instruments. The study, which was co-sponsored by BIC Graphic USA (UPIC: BIC), examined the role of the promotional writing instrument as an advertising tool and measured the effectiveness of advertising via the medium by measuring recall of the advertiser and the message. Consumers do indeed love their pens. Seventy-six percent of consumers surveyed consider the pen an important, very important or extremely important part of their daily personal activities. Distributors love them too. In 2011, sales of writing instruments sold by distributors totaled $1.59 billion—8.99 percent of total promotional products sold last year. Some of what the study found is every distributor’s and supplier’s dream—especially if the pen in question is a promotional pen. 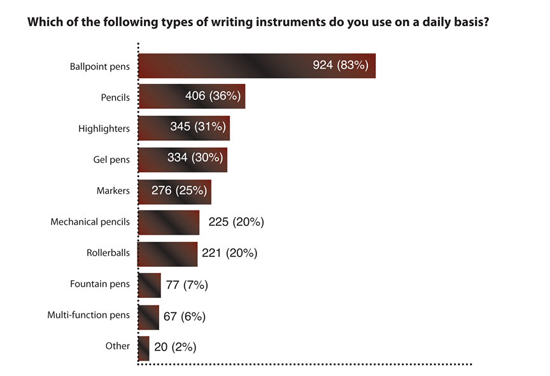 Seventy-seven percent of respondents reported having at least 10 writing instruments in their homes, according to the survey. 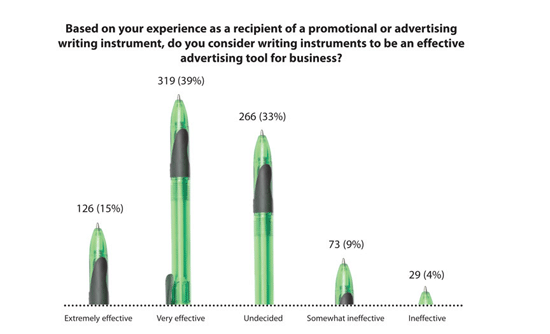 Slightly more than 34 percent indicated that at least 50 percent of the writing instruments were promotional in nature. Forty-four percent reported at least 10 writing instruments in their office or workplace, with more than half being promotional pens. Age and education make a difference when rating the importance of pens in people’s daily lives. Surprisingly, respondents 35 years or younger rated the importance of pens much greater than those over 65. And, the higher the education level, the higher the importance of pens. Cost per impression is another reason why pens are considered a promotional staple. The lower the impression cost per targeted individual, the more efficient the advertising campaign. Based on what the study found, for a pen costing the advertiser $1, the cost for each impression is only a fraction of cent or $0.000436. Message recall with pens is another positive factor. When testing recall for the group that had received at least one promotional pen in the past 12-month period, two thirds of them were able to recall the name of the advertiser who gave them the pen. Also impressive was the fact that 52.5 percent could remember the product or service information imprinted on the pen. When comparing recall on two pens received in the last 12 months versus one pen, the survey showed that recall of the name of the advertiser and the message goes down only slightly. Of those who received three or more pens in the past 12 months, only slightly less than a third reported not being able to remember any one advertiser’s name. Curiously enough, the study found that some businesses are failing to take advantage of pens for advertising purposes. 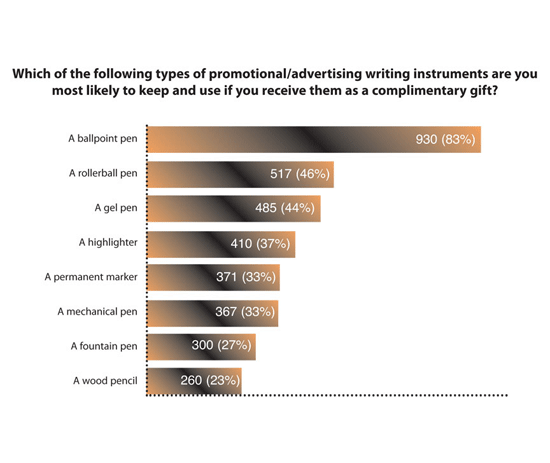 More than a quarter of respondents (27 percent) reported not receiving any promotional pens during the preceding year. This spells an opportunity for distributors. A promotional product is only as good as the length of time it remains with the recipient. In this study, 56 percent of recipients said they keep their promotional pen for as long as it writes. Read on for more highlights from the study. Get more stats, including purchasing habits and favorite brands, in the full study.